Host Mom Christine Palamidessi in the Middle. 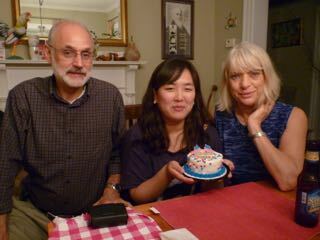 When my daughter Ruby was about six years old, and Matt and I realized we would not have more children, we decided to host international students in our house. What a joyful journey it has been! 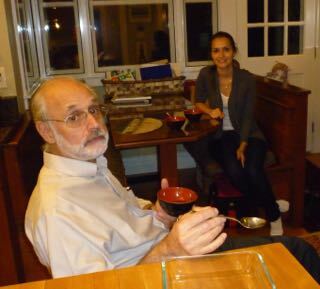 We have shared our lovely Cambridge home with students and scholars from every continent ( except Australia); eaten delicious food and even became huge fans of kimchee; helped a few students become American citizens; stood in as parents at a wedding and at a Harvard graduation; travelled to France, Italy and India with students; taught girls& young men how to cook and do laundry; listened to amazing stories; met friends of friends and parents of students. Most of the exchange of culture happened around the table. That’s what my stories focus around: food, conversations about food, and general stories told at the table. Recipes are posted in my blogs–recipes that students have favored and that I have learned to prepare. Miyuke, a wonderful Japanese woman who lived with us for a year, called me a ‘genius cook’ and I am sure most everyone but the big meat eaters who stayed with us would agree. I continue to be excited when each new student arrives at our door. I wonder how she/he will fit in, what they’ll like to eat, if they’ll help Matt in the kitchen, if they know how to use a vacuum cleaner. Do they speak and understand English? Some speak fluently but don’t understand a word. Some understand everything but can’t speak. The real young ones learn language skills in a flash. A few know all the non-verbal cues from watching American TV but not how to use them. The head tilts and eye blinks have sometimes caused us a lot of confusion. But we learn. A few years back I decided it was time to write about this beautiful experience that has filled our house with songs, and smiles, some tears, delicious food, and so much youth and beauty! Some of my host daughters become muses for my artwork. I don’t know if you’ll remember me, (Debi) Lee Davis (yes, I’m in the yearbook). I was also in your art class (as a person with no artist talent whatsoever) and you painted a picture for me for a dining room. I just saw your email to and from Paulette and decided to click into your site. I am amazed!!!!! First of all, I thought you would be some famous artist by now. You were soooo good! I do, however, see you as someone who would host internationtional students, and be involved with helping them move forward in their lives. How fortuntate they are to have the opportunity to share your house in Cambridge with your husband and son. You certainly have a full and wonderful life. I will see you at the class reunion.